Riverside is a large municipal cemetery. 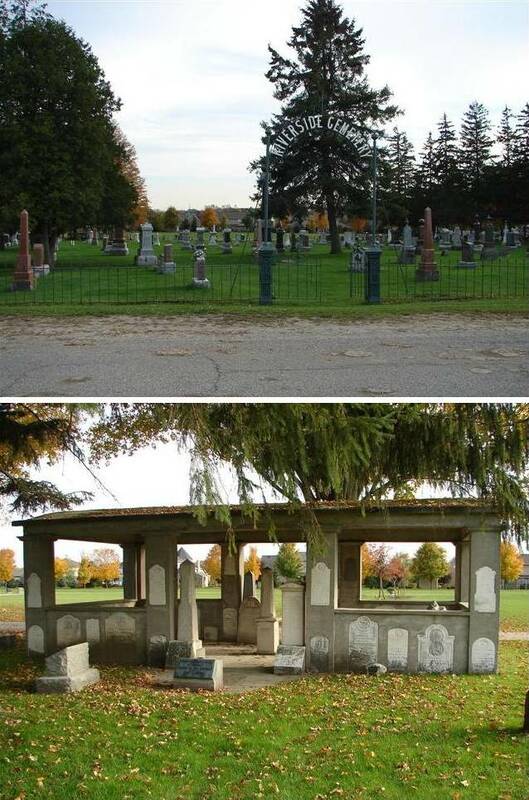 One interesting feature is the Riverside Cemetery Pioneer Memorial which is a canopied rectangular concrete structure about 15' x 32' with walls about 3-1/2' high, and with entrances on the north and south sides. Monuments are embedded in the exterior and interior walls, on the floor and at the north entrance. The monuments were originally erected in the burial ground of the Evangelical United Brethren on the north side of Huron Street, and in the cemetery on Wilmot Street associated with the Trinity Lutheran Church. The remains exhumed from the two cemeteries were reinterred in a common grave at Riverside without individual identification. Some of the monuments were removed to family plots in Riverside. The remainder were incorporated in the Pioneer Memorial. The original burying grounds are now occupied by residences. Son of Russell and Annie (Byer) Grove, husband of Ella Wideman.